"The best new media team in UK political campaigning history." It was with immense pride in what we had achieved as a country, and the part I had played as part of a genial team, that I heard these words from Angus Robertson MP, the Director of the 2011 Campaign for the Scottish National Party (SNP), as we celebrated a Scottish Parliament election win with a majority that, in the theory behind the design of the Scottish Parliamentary system, was never meant to be possible. I've written in greater detail about the strategy behind our winning campaign, and linked to much of the press coverage on this in the last few days, over on the NoTosh website. But there are lessons from this political campaign for those of us trying to build better learning communities. At the core of the online campaign was, after all, community building, and we did it in short term, with next to no budget, to great effect. No-one in the UK - or Europe - has come close to what a small HQ team, a couple of external team members (NoTosh friend Ian Dommett, myself and a team of crack creatives), and legions of volunteers and activists achieved over the past 100 days. The newspapers, the Party's leaders and tens of thousands of commenters on our Facebook pages and blogs have put it quite simply, using five words: "We won. We made history". When I started work on the campaign's digital strategy and tactics, with 100 days to go to polling day, all polls indicated that the Labour party were set to win: at one point we were 15 points behind challengers, the Labour party. Hope did, indeed, beat fear. 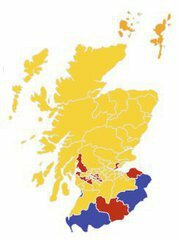 We redrew the political map of Scotland and, by engaging every demographic out there, helped make concrete the fact that the SNP really is Scotland's National Party. We helped shift the public viewpoint from one where, six weeks ago, the party languished some 10-15 points behind Labour, to one where it finished with an outright majority of 69 seats in the 129 seat Parliament, a majority of Scots wanting a Scottish government working for Scotland in the form of the SNP. The press have covered our campaign strategy, particularly the digital part I was lucky enough to co-direct with the inhouse head Kirk J Torrance. You can read about this in detail over on the NoTosh website. It's worth pointing out in that article the reference to the design thinking approach we took to generate, prototype and move forward over 100 ideas of digital and offline media engagement, an approach that resembles enquiry-based learning techniques and which generates significantly more workable, responsive ideas than drawing up papers, annual plans or working in isolation in a leadership team suite of offices. Online activism is not PR: it actually creates change in the real world (including that most critical of offline actions in an election: vote for us), rather than just creating the perception that something is changing in the real world. Most school websites are PR. Good school Facebook pages are relentlessly appearing on parents' and pupils' own feeds, at all times of the day and night, creating offline actions that are desirable (do your homework, here's some help, this parents' evening looks interesting - I might head along for it). All those who live in the land of "Yes But" do not belong in successful teams. Believing your goal is possible frees the mind to work out how you're going to get there, and prevents wasted hours debating "if" things are happening, and frees up space to ask "should" things happen. I have rarely worked with such a bunch of hyper talented, yet quietly spoken, unassuming, modest and generous people as the team at SNP HQ. That passion and talent, together with that very Scottish attitude and "let's work together" ethos, is what created the Scottish successes of the renaissance and industrial revolution, and will see us through the development of our next revolution in being at the centre of the Green Economy Reindustrialisation of Scotland. It certainly had a top place in achieving success on quite this scale. Clear messages on the learning vision for a school are, in my experience, a rare beast. School leaders could do a lot worse than employ some of these election campaign tactics in creating, honing and sharing their clear vision of learning with the school community at large. It's not good enough to say "We're all about learning". Are you about "Engaging youngsters and creating smiles every day"? Or are you about "The best examination results you can get". The former will almost certainly lead to the latter, but placing examination results as your core message will leave people in no doubt as to their decision-making process when faced with the choice of going down the avenue of an interesting, deep, rich discussion, or thumping on with content that has been pre-set, pre-planned. Having the best leadership secures you success Peter Murrell, the Chief Executive of the SNP, holds all the qualities I've just described. He's quiet, hard to gauge at first even, but is the smartest mind in political campaign management in the UK, quite possibly in Europe. He is, without a doubt and with no offence to the amazing people I work with every day, the most dynamic, alert and decisive Chief Executive with whom I've ever had the pleasure to work. He, Angus Robertson and, of course, the leaders of the party in Scotland itself (notably those with whom I was able to work most closely: Alex Salmond, Nicola Sturgeon and John Swinney), gave us permission to go with what our guts, and our data, told us felt right to do. "If you ever need anything" was the most common phrase I heard which, as an external consultant, is a gift. Thank you to the leadership team for their confidence, their trust and their support in helping Kirk, the team and me get our ideas out into bits, bytes and relationships. For me, this particular gig is now over. But there will be other elections, other campaigns. None of the lessons we've got here are anything that a half decent consultant with some life experience and an overdraft couldn't find out from their local book store and some choice reads on the web. That is why I have no issues sharing these elements of what some might call the "secret sauce". The secret of any sauce is, of course, in the subtle turns of the ladle that the entire kitchen staff put in over a service and that service, my friends, I've been very lucky to be part of for a history-making 100 days. You did a fantastic job, and I'm interested in the leanings not just for schools based resources online but for collaboration on changing education policy, including altering curriculum, teacher skills and education environments. All these issues tend to be regarded as impossible to change, but I'm convinced that's not the case. I'll be looking at your strategy in close detail to see what can be done to effect change for the better. Thanks for sharing here. Many congrats to all involved - huge lessons to be learned here about the positive impact that social media can bring to politics (with an obvious hat-tip to the Obama campaign four years ago) - thanks for sharing your journey! DK, the difference hopefully will be that unlike Obama, the SNP will continue to engage online. All these issues tend to be regarded as impossible to change, but I'm convinced that's not the case. I'll be looking at your strategy in close detail to see what can be done to effect change for the better. Will you be doing the Independence Campaign when it comes?